Dr. Johnson has performed in professional orchestras throughout the Eastern United States, including the Knoxville Symphony, River Cities Symphony, West Virginia Symphony, and Wheeling Symphony. He served as Second Horn with the Johnstown Symphony in Pennsylvania for two years and has finished runner-up and progressed to later rounds of several regional orchestra auditions. Since moving back to Georgia, Dr. J has performed with the Aiken Civic Orchestra, Aiken Symphony, Augusta Choral Society, Augusta Players, Augusta Symphony, Charleston Symphony, Columbia County Orchestra, Long Bay Symphony, Lyra Vivace Chamber Orchestra, and Savannah River Winds. Aside from orchestral playing, Dr. J is also active as both a chamber musician and soloist. He is a member of the Faculty Brass Trio at Augusta University and regularly performs as a member of brass and wind quintets. He has been featured as a soloist with both regional and university ensembles and has also performed at regional and international workshops, including the 2016 Southeast Horn Workshop and the 2016 International Horn Symposium. He has also been asked to teach at several different camps and international festivals, including the InterHarmony International Festival, Blue Lake Fine Arts Camp, and the New World Symphony. 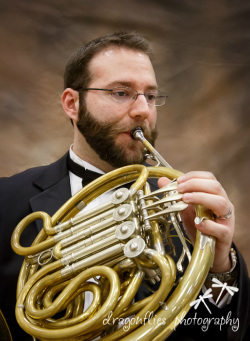 Dr. Johnson is an active member of the International Horn Society, having served as State Representative of West Virginia for four years. His articles have been published in The Horn Call, and he is frequently sought after as an adjudicator. Not only does he judge many of the regional and state competitions/festivals in his area, but Dr. J has also judged competitions at regional workshops and is a jury member for ENKOR International Competitions. Currently, Dr. Johnson serves as Instructor of Horn at Augusta University and USC Aiken, and served in the same capacity for Presbyterian College. He also served as an adjunct professor with Southern Wesleyan University, and currently maintains a vibrant private studio of young horn players in the Aiken, SC - Augusta, GA area. Dr. J's primary horn teachers have included Dr. Carrie Strickland, Dr. Darian Washington, Robert Pruzin, Calvin Smith, and Dr. Virginia Thompson. He studied for a short time with Bill Caballero of the Pittsburgh Symphony, and also received instruction from Gail Williams, David Jolley, Adam Unsworth, Lowell Greer, and Marian Hesse. Dr. J currently performs on a custom Yamaha 87 double horn.